Photo © John L. Pitts, used with permission, all rights reserved. Directions: Take St Francis Drive north to the northern side Paseo de Peralta. Turn right onto Paso de Peralta. Turn left onto Old Taoe Highway and then right onto Loma Entrada. On the side of Loma Entrada, directly opposite the beginning of La Mancha Court, is a foot path. Go down the stairs and along the path to the labyrinth. 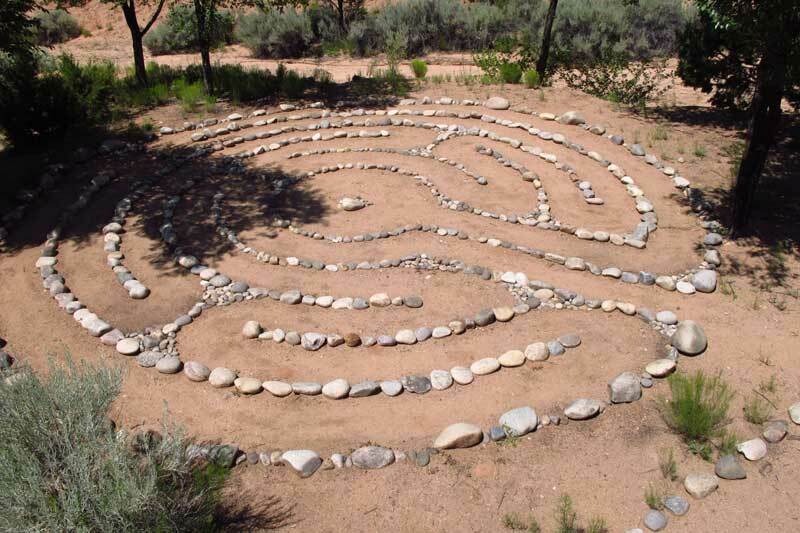 This labyrinth was built by the residents of Valle del Sol under the leadership of Blaire Carnahan and Hanna Kaiser, with the guidance of the Labyrinth Resource Group. It’s a classical style five circuit labyrinth, 20 feet in diameter, set in the trees on the edge of an arroyo. Click here for the Worldwide Labyrinth Locator.